Nikko was born on May 14 2015 and he is our firstborn son. Nikko since day one I always knew as his mother that he was angelic and filled a room with so much love with just his presence. What I didn't know was Nikko would be diagnosed at 11 months with Tay-Sachs disease and our world would come crashing down around us. Nikko at around 6 months had me questioning his milestones at this time he was still meeting them but it would seem if there was something off, I suspected autism and contacted EI services in our area. At 10 months I became really concerned as Nikko was not rolling or trying to crawl nor really babbling words however everyone insisted he was fine and I had anxiety as a first time mom. at 10 months I took him to a neurologist and she diagnosed him with low muscle tone and referred us to a eye doctor for a suspected lazy eye, that eye doctor apt sent my world crashing and my heart broke that very day as the Opthamologist looked at me and said Nikko had a red cherry spot in his eye and it's a sign as a lysomal disease. 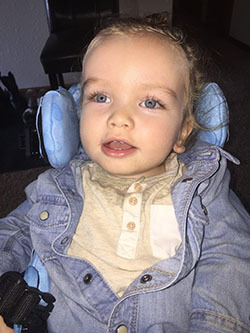 Well if you google red cherry spot in eye Tay-sachs is the first thing that shows up and Nikko had many symptoms, I prayed and I pleaded with god 2 weeks later our fears were confirmed our little perfect boy would die by 3 yrs old. I was also 7.5 months pregnant and told my unborn child could also be positive for this same disease, June 1 right before I gave birth his test came back negative, I was spared one more heartache. With love there is always a fight and always hope and that is how we get through each day. We fight and win and some days we lose, but Nikko fights through it all and that is why he is my superhero my SuperNikko!! Nikko is surrounded with love I'm so lucky my husband is such a amazing loving father and provider. Nikko's little brother Izaiah loves to snuggle and kiss him and show him off to everyone he meets. Together as a family we are.